Where to go when arriving at Gran Canaria Airport or where to enter the Las Palmas Airport Terminals for local, national, international and european flights? The Gando Airport Terminals are very easy to understand for passengers arriving or departing at this airport. 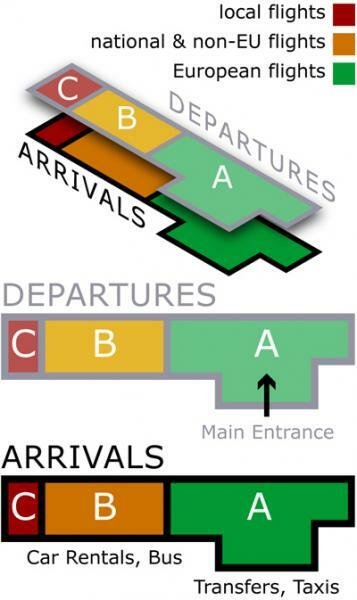 The Airport is only divided in 2 floor levels with 3 Zones each: In the upper floor all departures are handled, in the lower floor level all arrivals are taking their place (in the 2nd upper floor there are only a sighseeing terrace and internal offices located, so without further interest). The most important Terminal at Gran Canaria Airport is the (green) Terminal A, which handles all european flight-connections within the european community (Schengen States). The Main-Entrance for check-in to all flights is always the A-Terminal (upper floor), where Buses, Cars and Taxis can stop over for a few minutes. From the Parking decks you can reach also two additional smaller doors to enter nearer the local, national and NON-EU flights-Terminal B. The (orange) Terminal B is mostly used for flights to or via Madrid Barajas, Barcelona and other destinations at the spanish peninsula. Also flights, which depart to NON-Schengen countries or arrive from there are handled in this "middle" Terminal B. The (red) Terminal C is only dedicated to local flights from Las Palmas to Tenerife, Fuerteventura, Lanzarote, La Palma and El Hierro. The Terminal C check-in is not so complex, so that it is mostly enough to reach the Airport 1 hour before flight departure. On the Terminal C arrivals there are also no passport controls.